Access to your swimming pool can be made easier and safer with the installation of the right step system. In-ground pools may already have built-in steps or a sloping entrance to the pool. If not, ladders are a great alternative. In this article we look at the options for getting in and out of the pool. It is important to choose a ladder system which encourages safety. In-ground ladders are ordinarily made from stainless steel with curved handlebars for balance when entering. Treads are designed to avoid slipping and are available in plastic for comfort. Above-ground pools have a slightly more varied range of steps and ladders available, such as A-frame ladders which enable you to scale the ladder on either side of the pool for maximum safety. Most ladders come complete with fixing anchors. Always consult your local pool service technician before attempting to install a new ladder system by yourself and always follow the manufacturer’s guidelines. Due to the wet surfaces surrounding swimming pools, it is wise to install handrails for areas where there is a danger of slipping, particularly points of entry to the pool. Handrails that are specifically designed for pool safety are usually made from stainless steel and come in a variety of shapes and sizes to suit different areas. 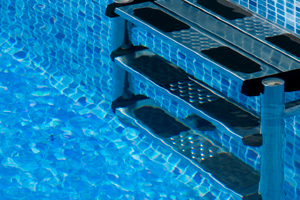 Handrails can be custom-made to suit the step or slope entry to your pool. There is a range of approved products available to make entering the pool easier for those with limited mobility. Usually these products are available in the form of lifts or winches. These are typically battery-operated, deck-mounted seats, with heavy lifting capacities that slowly lower the bather into the pool. There are more portable versions which will sometimes be used at commercial pools. Although commercial pools will usually stock this equipment themselves, it is always a good idea to call ahead to the pool and check whether it will be necessary for you to provide your own accessibility equipment. To discuss the best option for access in and out of your own pool you may want to speak to a local, independent pool supplier. You can find your nearest by using the links above. Do you have issues getting in and out of the pool? What devices or equipment have you found to make getting in and out of the pool easier? Let us know in the comments box below.